Content curation is an important tactic for a business to manage a strong and successful online presence. It lets a marketing department provide extra value to their customers and audience, and it is an important key to making a long-lasting relationship with a loyal fan. However, are you still struggling to discover what topics you should share and what keywords you should enter in the content generator? Are you looking for an easy way to get more shares and likes for your social media posts? In this article, we are going to share 7 almighty keywords to help you discover the most engaging content and brainstorm new ideas. You can combine the almighty keywords into your niche keywords and generate the unique content stream within a few minutes. Remember, only Fan Page Robot users have these privileges of creating the dynamic and unique content stream and autoposting that on their social media pages. With the help of Fan Page Robot, you can easily use your own keywords to find out the latest viral content around the web and autopost to your social media accounts. Posting funny memes is probably the easiest way to make your social media pages go viral. A meme is one of the most interesting forms of communication that can bridge the gap between cultures, languages, ages, and demographics. Memes are usually humorous in nature, and internet people love sharing something funny. They can help you get more exposure and improve engagement with your audience in an efficient way. Memes are so popular that you can find any niche with some funny memes that are already there. For example, even if you want to promote a very specific car model, like BMW Z4, you can enter “Z4 meme” in the content generator box of Fan Page Robot, then you will find so many funny pictures that you can share with your followers. If you are managing a fan page about luxury cars, you can search “Lamborghini meme”, “Ferrari meme”, “Aston Martin meme”, etc. There are so many keyword combinations you can use to create a dynamic content stream for your social media pages. Save the search to Content Mixer and enable the Autopost feature. Fan Page Robot will autopost the content when it finds new memes that match your keywords. Fan Page Robot can also automatically add a watermark to your copyrighted pictures when it automatically posts them on your multiple social media platforms. Take a minute to look at your Facebook timeline. How many images do you see? In most cases, images and graphics are everywhere. They catch the eyes of the viewers and tell a story far more effectively and interestingly than even the most well-crafted written messages. This is why one of the most popular forms of knowledge transfer online is infographics. You can use Fan Page Robot to search the latest infographics and autopost them when it finds new ones. Add the current year to the keyword, for example, if you search the keyword “car infographics 2015”, Fan Page Robot will give you the newest research on the topic this year. A lovely wallpaper is sure to convey the beauty and some important information that can capture your followers’ attention. Your followers will do appreciate the stunning HD pictures you share with them to enamor their eyes. The keywords can be “desktop wallpapers”, “iPhone wallpapers”, “iPad wallpapers”, or the name of any other device + wallpaper, if you want to break down the categories. Your followers can use them not only as a wallpaper but also as their Facebook/ Google +/ Youtube cover photo or Twitter page background. Did you know that more than 75% of recruiters would like to hire a candidate through various social media channels? There are a lot of job postings on social media every day, since companies use social media to find talents, and job hunters can find their expected jobs while browsing Facebook, Twitter, LinkedIn, etc. Search social networks for a job opening related to your niche and share with your followers. Your followers will love to help you spread the words, just in case that they have friends or family who will find the information useful. Your fan page will get increased reaches and user engagement in return. “Best” is another almighty keyword that can help your social pages get many more reaches. If someone searches for a particular term on Google, chances are --- he/she searches for it on Facebook, Twitter, and LinkedIn as well. This almighty keyword will definitely increase search exposure for your social pages and profiles. Sharing any forms of content like “car fail” or “birthday fail” is another trick to make your fan page go viral easily. Researchers say that people often like to enjoy at the misfortunes of others. It is surely no harm to make your followers digest some funny news and feel a bit better about themselves while you can boost the shares of your posts. The following screenshot is an example of news searches with the keyword “car fail”. 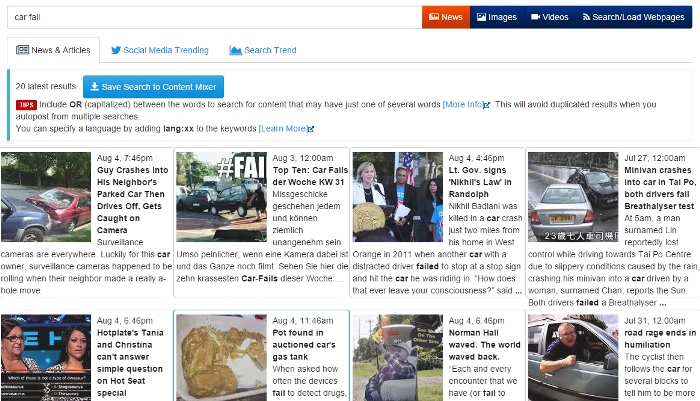 Save the search to that content mixer, and Fan Page Robot will automatically publish the news on your social media pages when it finds any new articles on “car fail”. Share some useful tips with your followers. If you’re in the fat loss niche, you can use the keyword “fat loss tips”, and if you’re running a marketing firm, you can share articles or pictures with the keywords like “marketing tips’ and “small business tips”. When your followers and visitors will find the tips useful, they will share that and will make their friends and family keep in touch with your pages. I hope after you read this article, you won’t have more struggles on how to find remarkable content to share. Do you have any great keyword ideas? Leave a comment below. We’d love to hear your thoughts. © 2019, fanpagerobot.com. All rights reserved.